The steady decline of the Arctic sea ice continues apace. Now the areal extent has dropped below the 2007 record which was amassed because strong winds compressed the sea ice from the West. Since then the actual ice mass itself has continued to decline and today with no help from the wind we have dropped below the 2007 record. This report mentions 34 years, but all that means is that is when we began to get satellite coverage and could even know this. The North West Passage is wide open and if you look closely, there is no evidence at this resolution of any ice shelf remaining attached to the Northern shore of Ellesmere island. All the long term ice is out there in the middle of the ocean been broken up. The North East passage appears somewhat choked at this resolution but is likely quite navigable. The big question now is just how stable is the ice content in the Arctic Gyre itself. Is it able to replenish multiyear ice or does all multiyear ice eventually escape? Outside the core of the Gyre we are looking at badly diminished ice pack that could well continue to decline for years. At this point the main loss has taken place and we need to know if it will stabilize at something looking like this. It has taken a mere five years for all that ice to be lost. If the same rate of attack can be sustained, then there is no way any will be left inside the next five years. I publicly predicted back in 2007 that the bulk of the ice would be gone and was surprised by the rapid changes that occurred hat year. We are here and my underlying argument has stood up very. We are missing most of the ice and even better we are free of significant channeling by the coasts. I am presuming the open waters effect is also sufficient to overcome the chilling effect of the core of the Gyre as it seems likely. Right now though we can only guess what a stable configuration is going to look like. The fact remains that the Arctic sea ice has melted out and we are now looking at a slow end game as the sea surface stabilizes with its new regime. As per reports being retrieved from National Snow and Ice Data Centre from Colorado, it has been revealed that Arctic sea level is dropping with passage of time. 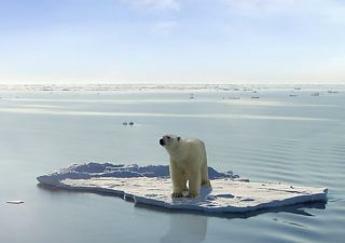 The record has further revealed that the ice extension is not more than 6.53 million square kilometers, which is said to be the lowest since 34 years. Before the current data was unveiled, September 2007 data was considered to be the lowest one, but now things have gone even worse. 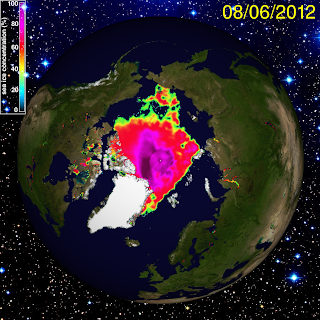 Experts said that July 2012 could be the season where maximum melting would be observed at Arctic sea. One of the main reasons for which Arctic ice has been melting is the presence of open water that comes from the Atlantic side, which includes Kara, Laptev and East Siberian seas. It shall however, be noted that Arctic Ocean is not the only place where melting has been observed. It has been noticed by NASA that Greenland ice sheet has been witnessing melting and July seems to have taken thing to a different level. “Summer sea ice extent decline and the early northern hemisphere snow melt, the pace of Greenland surface melt suggests that 2012 is yet another interesting summer in the Arctic”, said officials from National Snow and Ice Data Centre. Sounds like more alarmist propaganda to me. Lot of good things happen when all that ice melts. More wildlife, more travel routes, more fish. You should report that. hardly alarmist and i see no link with arctic warming and so called global warming that is safely attributable to human intervention. The most creditable explanation is a readjustment in the ocean currents which affect the surface waters.